China’s currency and foreign exchange reserves have been front page news since the start of 2016 because they impact Western stock markets and economies. After bleeding almost $100 billion in January to defend the value of its currency against the U.S. dollar, speculating the yuan would fall became a one-way bet. “Extreme credit growth usually leads to a credit bust,” Mark Hart of Corriente Capital said in an interview with RealVisionTV. He thinks the Chinese currency will drop 50 percent in value this year. To his credit, he got into the trade before everybody else in 2014, but his 50 percent drop scenario hasn’t materialized yet. Instead, foreign exchange reserves decreased only $29 billion in February (to $3.2 trillion) and investment bank Société Générale thinks they may even increase in March. Likewise, the yuan even went up a little bit against the dollar in 2016. 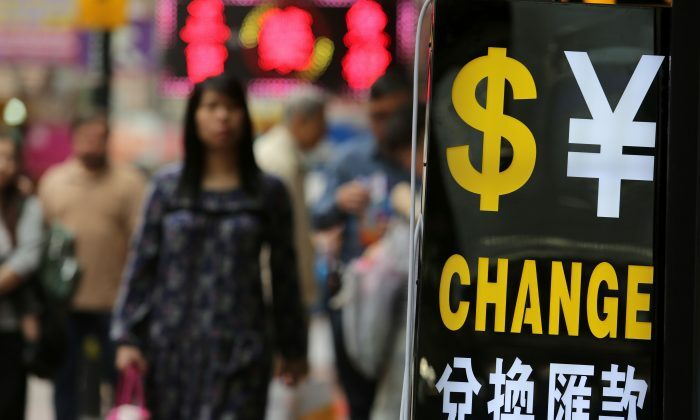 “The accommodative global sentiment notably reduced depreciation pressure on the Chinese currency, and, as a result, the renminbi (RMB) weakened against a basket of other currencies in March without weakening against the dollar at all,” analysts Wei Yao and Jason Daw write in a note. “China is likely to continue to face substantial net capital outflows, and there remain concerns that the RMB may at some point be devalued more meaningfully in the face of persistent declining reserves.” The IIF believes outflows could total $530 billion in 2016. In April China released a breakdown of capital flows called the Balance of Payments, which shows who exactly is moving money out, thereby putting pressure on the exchange rate, or moving money into China. “First, external debt deleveraging is likely nearing the end and should be welcomed in any case. Second, the authorities seemed to have some control, even overshadow outflow channels,” according to Société Générale. This means that China’s corporations are paying back dollars they borrowed before when they expected a rising renminbi. 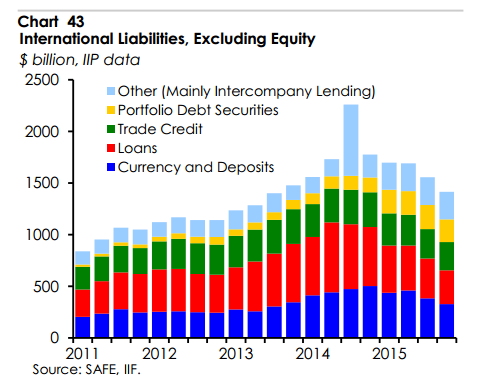 And while Société Générale thinks the repayment of debt may soon be over, China still has about $1.4 trillion in foreign liabilities. “The unwinding process has already gone quite a long way but could potentially continue to feed significant outflows,” the IIF report states. In addition, Chinese companies are not only paying down debt but also snapping up foreign companies like there is no tomorrow or are at least trying, like the Chinese insurance company Anbang, which bid $14 billion for Starwood Hotels but later abandoned the offer. However, companies are not the most important actors in the China currency game: It’s the Chinese people. They are allowed to transfer $50,000 overseas every year and can also invest in foreign stocks, bonds, and real estate through other channels or withdraw up to $15,000 with the UnionPay while traveling in foreign countries. If only 5 percent of the Chinese population chose to use this limit, the whole $3.2 trillion would be wiped out. This is why investor Kyle Bass of Hayman Capital says China’s reserves are inadequate when measured against all the deposits which could be transferred. He said the currency will soon devalue. Nick Lardy, a senior fellow at the Peterson Institute for International Economics thinks this is not the case and believes the outflows will stop as soon as companies have paid back their dollar debt. “The view that the decline in China’s foreign exchange reserves is because panicked mainlanders are desperately seeking ways to get money out of the country is misinformed. Rather, the decline largely reflects the unwinding of the renminbi carry trade and Chinese companies paying off dollar debt, both of which are self-limiting. Thus, the market is unlikely to force a large currency depreciation,” he said in a presentation at the Peterson Institute. However, both Société Générale and the IIF have compelling reasons to think the opposite is true, according to the Balance of Payments data. “Resident portfolio outflows remained modest but rose notably to $9.5 billion for equity and $6.4 billion for bonds, highlighting Chinese (retail) investors’s increasing appetite for overseas securities,” the Société Générale report states. “This process of international portfolio diversification has only just begun. At present, the home bias of Chinese investors is much higher than in mature economies, and this should gradually decline as income levels continue to rise and China continues to liberalize its financial account,” states the IIF. Because the Chinese regime takes these flows seriously, it has done the opposite and stopped the liberalization of outbound investment but relaxed the criteria for foreign investment in Chinese bonds and stocks. So the traders betting against the Chinese currency may still get their rapid devaluation scenario, despite the recent recovery.